It wasn’t quite fair, I admit, to describe the delicious little tartlets so beloved in Leipzig and tell their story without including the recipe. Making them is not difficult: they are simply shells of tart pastry filled with almond merengue and topped with a pastry cross. Just remember that you can’t sell these at your church bazaar or bake sale calling them Leipziger Lerchen — the name Leipziger Lerche is been protected by the Saxonian Bakery Guild. Even a baker from Leipzig whom we met at the Boyce Farmers Market in Fredericton, New Brunswick, didn’t presume to call them by their protected name. But a Leipziger Lerche by any other name would taste as sweet. Pastry: Sift flour into a bowl. Add butter knead in with your fingers. Stir together the egg yolks, sugar, salt and brandy and stir into flour mixture until well mixed. Knead until dough is smooth and holds together well. Wrap dough in plastic and chill 30 minutes to an hour. Unwrap dough and roll on a floured surface until it is a little over 1/8-inch thick. Cut several narrow strips from the rolled dough and set aside. Cut the remainder in circles and place each in a small fluted tart mold, lightly buttered. Press the dough into each, making sure edges extend a bit above the top. Pierce the bottoms once or twice with a fork and spoon a dab of jam into the center of each. Preheat the oven to 350°F (175°C). Filling: Whisk egg yolks lightly until blended and reserve about a teaspoonful. Beat the butter until light and fluffy. Stir in the powdered sugar gradually, then the egg yolks, almonds and almond oil or extract. Combine the flour with the cornstarch and stir into the almond mixture. Beat the egg whites until stiff and fold in gently until blended. Fill pastry shells with almond mixture. Cut the strips of reserved dough into lengths a little shorter than the diameter of the tarts and place a cross of dough on top of each. Mix reserved egg yolk with a few drops of water and brush carefully on the crosses to glaze. Bake for about 20-25 minutes, until pastry is golden. Leipzig’s signature pastry is the Leipziger Lerche, Leipzig Lark. The name is more than a mere flight of fancy. Since Medieval times – and probably before that – songbirds and especially larks were a popular dish, and those fattened in the terroir of Leipzig’s riversides were especially sought-after by those who could afford the luxury. Larks from the city were shipped by the hundreds of thousands each year to be stewed, grilled, pan-fried, sautéed and roasted in kitchens from Madrid to Moscow. Leipzig’s own favorite recipe, known as Leipziger Lerchen, stuffed and trussed the tiny birds (they are only about six inches long) and wrapped them in pastry to roast. Hunting and exporting larks was a highly profitable business as early as the mid-1600s and by the 1720s exports from the city and surrounding region reached over a million annually. This mass slaughter of songbirds was decried by wildlife advocates for a century before the Saxon King Albert I outlawed their hunting in 1876. Residents mourned the loss of their special dish, and an inventive Leipzig baker created a pastry to commemorate this lost pleasure. History doesn’t tell us the name of the baker who first created Leipziger Lerchen as a sweet pastry, nor can anyone claim to have the one original recipe. Each bakery developed its own version, but the basic ingredients, method and shape are all much the same. Small fluted tart shells of butter-rich pastry are filled with a mixture of ground almonds lightened by beaten egg whites. Beneath this filling is a dot of red jam or a cherry, which – or so the story goes – represented the heart of the lark. Before baking, the tart is topped with a small cross made of the pastry, thought to represent the trussing that held the stuffing in place. If you see these pastries for sale anywhere outside of Leipzig, they will (or should) have another name — the name Leipziger Lerche has been protected by the Saxonian Bakery Guild since 1998. You could drop a cookie on a map of Germany and be pretty sure that wherever the crumbs fell there would be a town with a Christmas market. But nowhere is there a more varied and interesting group than in Baden-Württemberg. Baden-Württemberg is in the southwestern corner of Germany that borders France and Switzerland. It includes well-known tourist destinations of Heidelberg and the spa town of Baden-Baden – both of which have good Christmas markets of their own. But the part I like best at Christmastime begins in the region’s capital, Stuttgart, and includes the beautiful Medieval towns of the Black Forest. These villages of half-timbered buildings seem to have been designed as stage-sets for a Christkindlmarkt, those clusters of colorful cabins fragrant with fresh-cut greens, roasting chestnuts and spicy ginger cookies. And each market has a different way of celebrating the season. We stepped back six or so centuries into the half-timbered squares of Esslingen, a short train ride from Stuttgart. Its location at the crossing of trade routes made Esslingen a prosperous market town from as early as the 8th century, leaving it with an eye-catching center filled with original medieval buildings. These form the setting for the Mittelaltermarkt, an authentic Medieval street market, where merchants and craftsmen dress as their counterparts would have dressed in medieval times. Under canvas market tents are handcrafted leather cases, silverwork, calligraphy, hand-bound books, clothing of handwoven wool and linen, wooden bowls, handspun and plant-dyed yarns. Many craftspeople work as they sell: a blacksmith forges ornamental hooks in front of his forge, basket makers weave and you can have your own incense custom blended as you watch. Entertainment and children’s games are all authentic to the era — stilt walkers, minstrels, fire walkers, troubadours and jugglers — as are the foods. We feasted on venison goulash and roasted meats, munching on bread baked around a stick, and sipping berry wines in a square lit by torches. A shuttle bus took us up to the crest of a steep hill, where the beautifully preserved castle of Burg Hohenzollern opens in December for the Royal Christmas Market. Inside its thick stone walls, wooden cabins in the forecourt serve thin German pancakes and glass mugs of hot gluhwein. The castle’s elegant halls are filled with high-quality local crafts and art. This is a juried market, with beautiful works, many original designs and one-of-a-kind works in wool, silk, leather, glass and wood. Here we found the most perfect springerle – white anise seed cookies formed in intricate hand-carved wooden molds. Much too pretty to dunk in coffee – as they are designed to be eaten. Even deeper into the Black Forest, in a steep wooded valley under the stone viaduct of the 190-foot-high Devil‘s Valley Railway bridge, is the Ravenna Gorge Christmas Market. We visited at night, walking up the hill on a path behind the historic Hofgut Sternen inn to a clearing where 40 stalls are lit by lanterns and twinkling lights. Every now and then a train would rumble far overhead as we munched our way past cabins selling Black Forest specialties, including the famed hams we’d savored at dinner in the inn below. The smallest Christkindlmarkt we went to, in St Blaisen, was also the most endearing. It reminded me of a traditional New England church Christmas bazaar. All the little cabins were local craftspeople or civic groups, but that didn’t diminish the quality of the work we found there. Exquisitely embroidered fabric-covered buttons, colorful felted wool jewelry, hand-made wooden toys, shimmering jellies and tangy mustards, fragile herbal wreaths, bundles of mistletoe, and on the church steps the warmest hand-knit wool sox we have ever worn. They were made by a local group and the proceeds go to fund a job training program for farm women. As we shopped, a choir of school children sang carols. It was small-town at its best, and we left St Blaisen with warm feet and warm hearts. For more information, visit Baden-Württemberg Tourism. ‘Tis the season! Christmas markets have opened throughout Germany, each one filled with cabins piled high with spicy gingerbread, fruit-filled loaves, crunchy nut cookies, rock-hard springerli for dunking, glistening candied fruits, glazed nuts, sugar-dusted doughnuts, buttery shortbreads, and steaming kettles of glühwein– the hot mulled wine that warms my hands as I walk from treat to treat. I’m in my favorite corner of Germany, in the southwest where the smart modern city of Stuttgart leads into fairy-tale villages of the Black Forest. Stuttgart is a highly overlooked city, which makes it especially appealing, with fewer crowds to jostle for a seat in its starred restaurants (it has more Michelin stars than any other place in Germany). And its Christmas market is one of the largest. Several hundred wooden cabins decorated with fragrant greens and rooftop holiday scenes line its streets and squares. The largest square is designed for children, with a miniature village and booths where they can bake their own cookies and dip candles. But I head into the thick of the market, under an archway of twinkling lights and along a promenade formed by cabins displaying Christmas decorations and handcrafted gifts. They are tempting, but I resist, keeping my hands free for the food. Ah, the food. White springerle with delicate scalloped edges and intricate embossed designs are displayed beside their hand-carved wooden molds. They are so beautiful that I feel guilty dipping one of the rock-like confections into my tea at a nearby café, but what a lovely new blend of flavors, adding a delicate anise scent to the tea’s aromas. Rows of gingerbread boys are dressed in bright frosting clothes, and more gingerbread cookies are cut in reindeer heads and the traditional big hearts frosted with greetings of love and seasonal cheer. Honey-rich lebkuchen full of spices and ground nuts are everywhere, cut into stars, frosted, dipped in dark chocolate, loose, packaged in fancy boxes, each made from a slightly different cherished recipe, but every one dispersing its spicy fragrances into the air. These mingle with the unmistakable fragrance of roasting chestnuts from a cute roasting wagon shaped like a steam engine. A paper cone full of these is a good hand-warmer. Nearby is a basket of “marzipan potatoes” – uneven little lumps of almond paste rolled in powdered cocoa. Almost as ubiquitous as lebkuchen are stacks of warm Berliners, jelly- and custard-filled doughnuts rolled in glistening sugar or sometimes drizzled in frosting. Alongside them are buns filled with candied fruit, and loaves of fruit-filled sweet bread. This is the traditional stollen from Dresden, and bakers have traveled here to sell it. It’s not all gingerbread and cookies. Along with the sweets are plenty of savories – plump juicy wursts on toasted rolls slathered with tangy mustard or pungent curry sauce, pots of savory thick soups, bright pink salmon on cedar planks above a bed of glowing coals, hot pretzels and booths dispensing thin pancakes spread with honey or fruity jams. The fragrance of good things sizzling on a hot grill summons us, and we find Krautspaetzle, the thick Swabian dumplings called spaetzli stirred on a grill with chopped bacon and sauerkraut. We crowd into a tent sheltering a pop-up cafe and its impromptu kitchen, sharing a table and benches with locals. There’s an instant conviviality of warm food that transcends language and prompts strangers to strike up a conversation. Of course the subject is food. Padrones are the Russian roulette of Spanish cuisine. 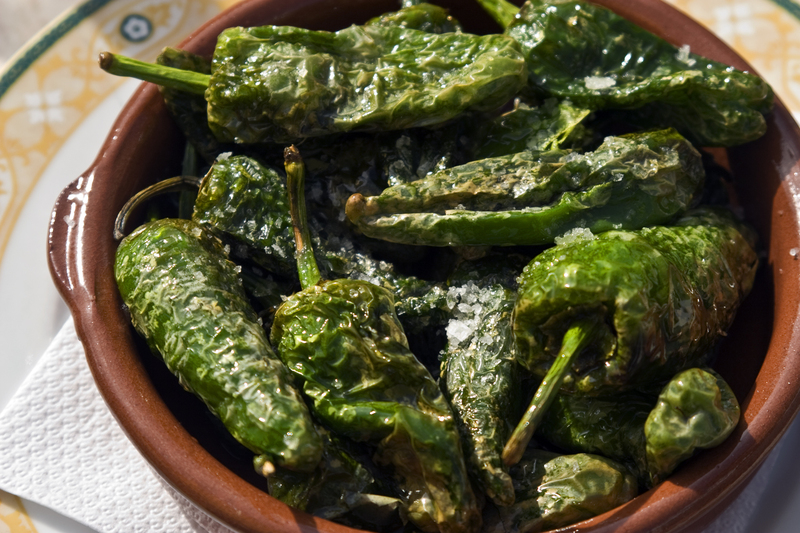 Sweet, intensely flavored, sautéed quickly and enlivened with crystals of sea salt, they spark the appetite and go down well with a glass of Rioja. Most of them. But one or two in every innocent-looking terra cotta dishful explodes in your mouth like a fire bomb. Flames shoot out your ears and scorch the edges of your hair. Padrones are especially popular in the Canary Islands, where a traditional meal begins with a dish of these and a dish of papas arrugadas, small potatoes boiled in saltwater. These potatoes are served with two bowls of mojo, which are much more up-front about their burn factor. The green one is mild and made of fresh cilantro; the red one is made with red peppers and is picante – hot — in varying degrees. But rarely as hot as the rogue padrones. Apart from the padrones, the food you’ll find in Spain’s Canary Islands is pretty straightforward. It’s rarely pretentious or fussily presented, the empassis is on flavor and fresh ingredients. The seven islands in the archipelago share a common food heritage, and you can sample it best at small local restaurants, especially on Tenerife. Ironically, it is on Tenerife, the most touristed and cosmopolitan of the islands, that you will find the most restaurants proudly serving traditional Canarian cuisine. The reason has much to do with current food trends. While other islands are still trying to make travelers feel comfortable with foods of their homelands, Tenerife has come to realize that today’s traveler wants to sample local cuisines. The number of places advertising typical Canarian foods shows this new awareness of local food traditions. Chefs on Tenerife have long appreciated the ingredients produced by local farms, dairies and vineyards. They may not yet use the word ‘localvore’ to describe it, but, the concept of using local products in traditional ways was popular here long before it became fashionable. That’s not to say that Tenerife doesn’t offer a full range of “exotic” dining, from Italian to German to Peruvian to Irish pub food. The array of international styles found at resort restaurants is astonishing, but it would be a shame not to sample all the local specialties in a typical Canarian restaurant. Fresh fish is almost always on the menu – after all, the islands sit in the Atlantic Ocean – and may be a bewildering assortment whose names are untranslatable. If in doubt, ask to see the fish. 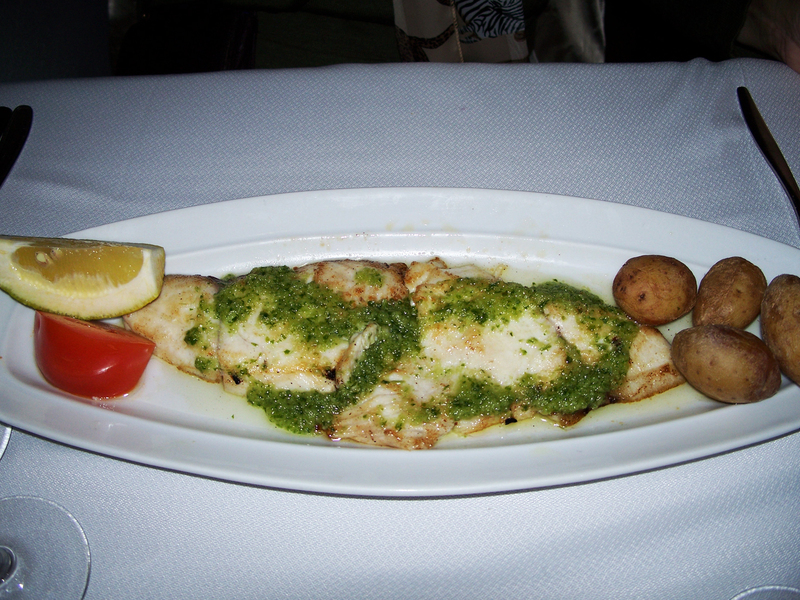 These are most often served fried or grilled, and in general, local chefs are at their very best with grilled white fish, which is cooked to juicy perfection. Another favorite is shrimp sizzling in olive oil and garlic, served in a terra-cotta tapas dish. However they are prepared — in a lightly spiced sauce, fried in a light batter or in creamy rice dishes — the shrimp are excellent, as are steamed or roasted mussels. 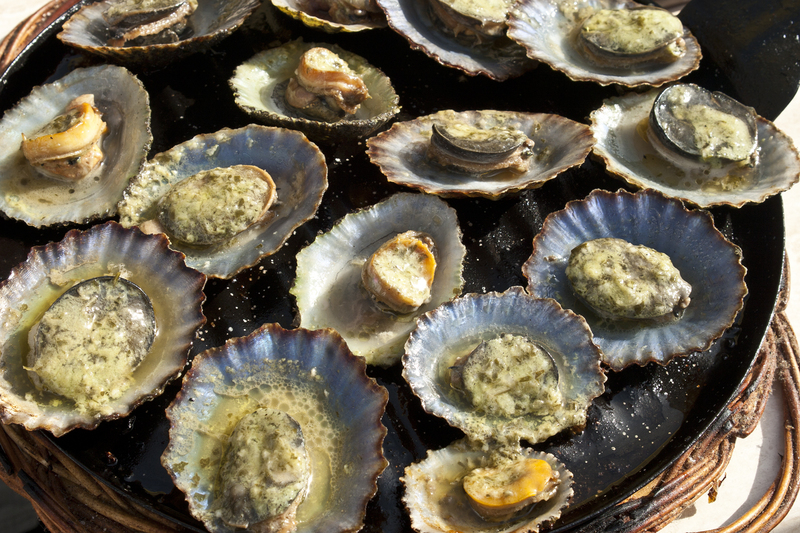 Limpets are especially delicious, lightly sauced with herbs and garlic and roasted on their shells. In addition to the fresh seafood, pork and chicken are always offered, and rabbit and goat are also common in traditional restaurants. Meats are usually served as chops or cutlets, and in various savory stews. Soups and stews are the most typical Canarian meals. Potaje has only vegetables; rancho canario has meat, and puchero has even more meat. A staple food of the Guanches – the island residents before the Spanish conquest – is gofio, a mixed grain once eaten as bread, and still used to thicken stews. Another common stew is garbanzo compuesto (chick-pea stew with meat), often available as a first course. Except in Santa Cruz, most restaurants serve both full meals and light lunches – you can get a hearty meal at midday or in the evening, and can also get a sandwich, salad or light meal of tapas (often called “entradas” here) for lunch. Canarians are casual about what you are expected to order at any time of day, happily serving several appetizers or tapas in place of a main course in the evening. More formal resort restaurants tend to be less flexible, but small independent restaurants still think customers should be able to eat what they want, when they want it. While Americans are getting in the Halloween spirit and Mexicans are preparing for spirits of their own on the Day of the Dead, Alba Italy is also gearing up for a celebration of something dark and mysterious. Truffles. These unprepossessing little dirt-colored nuggets grow underground in the oak forests of the surrounding Langhe Hills, in northern Italy’s Piemonte region. Unlike the more common black truffle rooted out by pigs in France and elsewhere, the white truffle is creamy white under its dark skin. And its intense flavor and haunting aroma is coveted by chefs. These truffles — Tuber magnatum pico — are prized so highly that the warty little funghi are known as white diamonds. For good reason – the going price is about $3500 a pound. While a few ounces of thumb-sized white truffles would stock the wine cellar with the local Barolo, real money comes with the exceedingly rare big truffle. 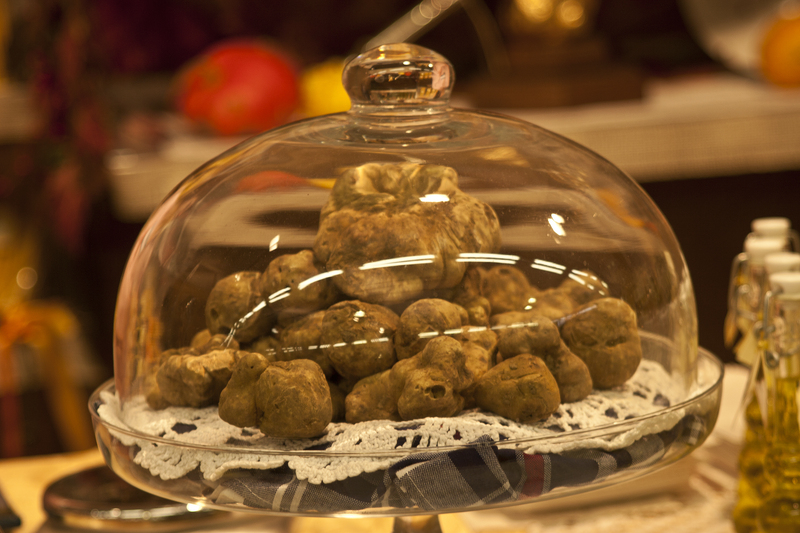 Price records were shattered by the 2007 auction of a 3.3-pound white truffle: the final selling price was $330,000. As you might guess, finding these is not all that easy. They are rare and their habits a mystery to all but a few trifolai, whose highly trained dogs roam the woods with them to sniff out the prizes. And even when they know all the white truffle’s secrets, a truffle hunter will be delighted to return from a foraging trip with only a small bag of them. 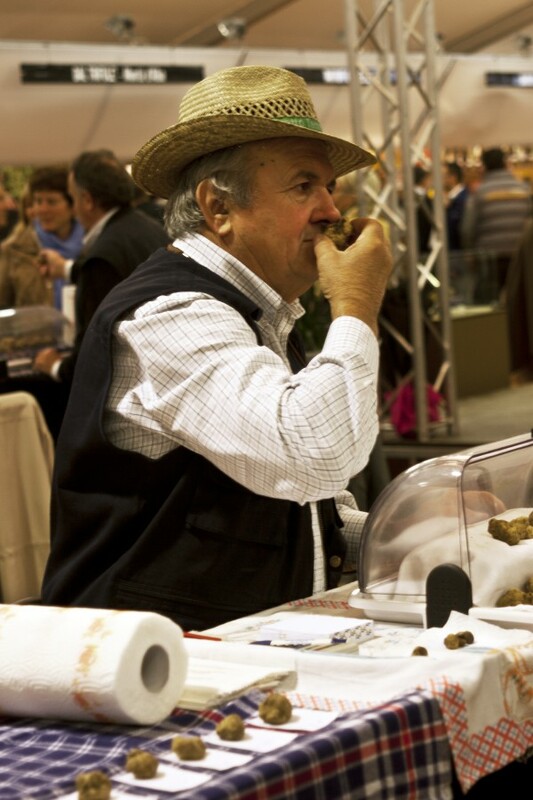 The best season for truffle hunting is autumn and winter, and in late October and early November the world’s chefs and their agents congregate in the Medieval town of Alba for the annual Fiera Internazionale del Tartufo Bianco D’Alba, the International White Truffle Fair. Each Saturday and Sunday the tent in the arcaded Cortile della Maddalena opens to reveal a world of flavors and aromas dominated by the intense heady fragrance of truffles. The fair is not just for serious buyers; a lot of food-lovers like me are busy inhaling, too. At the price of truffles, I figure that a few truffly sniffs is worth the cost of admission. I’m there early, just after the tent opens, and I make my way past rows of regional food producers displaying the Piemonte’s best, which many think are also the best of Italy. Cheesemakers offer me samples of Gorgonzola, vying with burly butchers coaxing me to take thin slivers of salami and prosciutto from nearby Bra, famous for its cured meats. A rosy-cheeked farmer proffers generous chunks of tangy Piedmont mountain Toma. Tempting me at the neighboring booth are samples of hazelnut cake from Cortemilia and fat Piedmont hazelnuts, roasted and cemented into rich, dark chocolate. I munch my way past these, and around the central market of studiedly rusticated trifolai with their little stacks of unimpressive-looking – but highly prized – white truffles, making deals with the chefs and traders anxious to buy them. At the back of the tent, people stand around tables, savoring dishes of fried eggs. I join a short line and wait for my own, watching the black-coated truffle slicer, his hands hovering in a blur of motion above each plate as he shaves a layer of precious white truffles over the still-sizzling eggs. My ambrosial eggs are accompanied by a glass of Barolo, the Piedmont’s signature wine. This is my idea of breakfast. If the mid-coast Maine town of Rockland were in New Hampshire, its motto might be “Live free and eat pie.” At least it would be in January, when the entire town gears up for Pies on Parade. For those who come just for the main event on Sunday (this year it’s on January 25), it’s a day devoted to eating pie — mince pie, Key lime pie, wild Maine blueberry pie, pizza pie, meat pie, whoopee pie (not actually a pie, this New England favorite is a hand-sized chocolate cake sandwich filled with frosting). For those wise souls who arrive on Friday or Saturday to make a weekend of it at one of the sponsoring Historic Inns of Rockland, it’s a weekend extravaganza of pie eating. We were there last year, happily devouring apple pie for breakfast at Berry Manor Inn, French Canadian pork pie for lunch, dainty fresh fruit pies for tea-time, scrumptious wedges of tart cherry pie for bedtime snack. 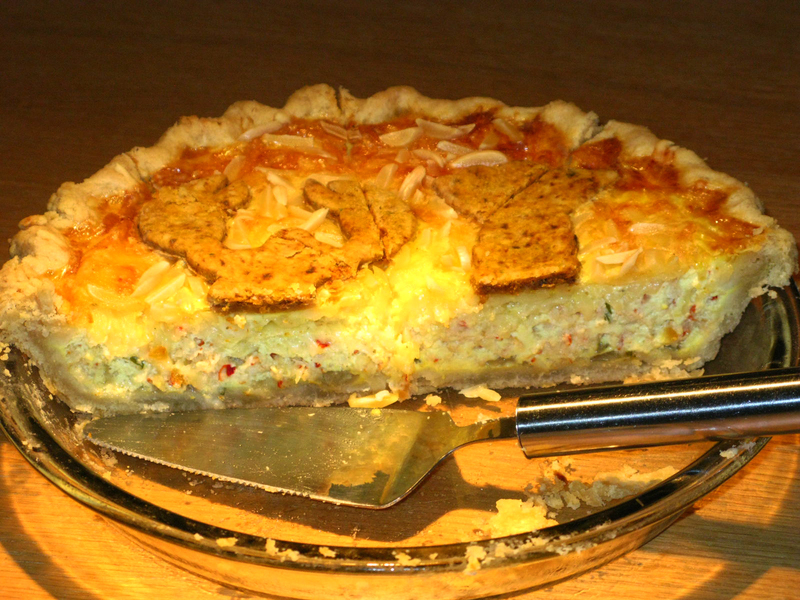 The previous year we’d begun our day with a delectable lobster quiche at Granite Inn. We haven’t stayed at the third sponsor, Lime Rock Inn, but we stopped there on our tour for their specialty Key lime pie. It’s not just the B&Bs and restaurants that go all out for pies. Pies on Parade benefits the local food bank and heating fund, and businesses, even museums join in. Project Puffin Center, where we warmed up while watching a film about their nesting project, we had “cream puffins” — bird-shaped cream-puffs with bright orange beaks. Every oven in town must be going non-stop. Rockland is better known in summer as home port of the Maine Windjammer fleet, but even in mid-winter we found a surprising lot to do between sampling pies. On Saturday we toured the Farnsworth Art Museum, where two rooms are filled with paintings by Andrew Wyeth and others show works by Winslow Homer, Gilbert Stuart and Childe Hassam. It’s a collection any city would be proud of. As we restaurant- and café-hopped on Sunday, we learned about lighthouses (and had lemon merengue pie) at the Maine Lighthouse Museum, and tasted wines at Breakwater Vineyards, where this year they’re serving pumpkin whoopee pies with Chardonay. Another take on the whoopee pie – this one made with Meyer-lemon-infused olive oil — was at Fiore, where we sampled rare olive oils and balsamic vinegars. All along Main Street we stopped in businesses displaying Pies on Parade posters, where we were invited to sit at tables in cafes, pubs and restaurants to savor wedges of savory meat pies, mince pie made with meat and dried wild main blueberries, mini pizzas of shrimp and goat cheese. Local products were favored – Miranda’s served a Reuben pizza on foccacia with Morse’s Sauerkraut. At B&Bs we tried quiches and delicate little tartlets filled with fresh berries. We chuckled at some of the pie puns as restaurants stretched the definition of pie (pie-ayuh with seafood and chorizo at In Good Company, for example). The local good humor set the tone for visitors, too. After a few stops, we began greeting fellow pie-eaters we’d seen in the museum or at another restaurant, and struck up conversations. We compared notes on pies, restaurants and our respective lodgings. We exchanged hellos with volunteers we’d met the day before. We felt like natives. When we finally adjourned for the night to our elegant Victorian room at Berry Manor Inn, owner Cheryl Michaelsen tempted us with a bed-time snack we couldn’t resist even after a pie-filled day: of a wedge of her mom’s cherry pie. By then we were positively high on pie.